Crazy Eddie's Motie News: An early happy 9th birthday to Coffee Party USA and Happy Irish Coffee Day! An early happy 9th birthday to Coffee Party USA and Happy Irish Coffee Day! A year ago today, I wished my readers Happy Irish Coffee Day and Happy Birthday to Coffee Party USA! Today, I am reversing the order and wishing Coffee Party USA an early happy 9th birthday. I begin the celebration of the anniversary of the founding of the nonprofit for which I'm a director with Birthday by The Beatles. If it's a birthday, then there must be presents! I am asking my readers give a gift to Coffee Party USA by making a donation of $9.00 (or more) to match the $9.00 donation I made yesterday. Your donation will allow "you to be a part of the important work of Coffee Party USA as we empower and connect communities to reclaim our government for the people." It will go to improving our website, the new version of which Coffee Party USA debuted in October and registering people to vote with our partners TurboVote and National Voter Registration Day. There are municipal and some state elections coming up this year and people need to be registered and reminded to vote in them. If donating is not enough, my readers can become a member or volunteer. Coffee Party USA needs people to help with all the projects listed above and then some, as we plan on doing even more to empower and connect communities to reclaim our government for the people in the future. Once again, I am asking my readers to match my donation of $9.00. The other directors and I will thank you now and American democracy will thank you later! Follow over the jump for a celebration of Irish Coffee Day. Since I'm an environmentalist, I'm going to recycle. This year's recipe is for Nutty Irish Coffee. The Irish coffee gets a creamy and hazelnut twist! 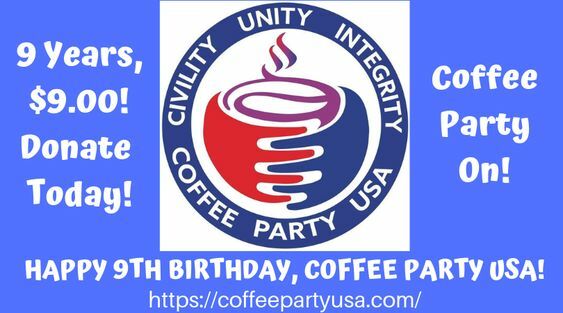 In addition to toasting one's good health to celebrate two coffee days in a row, remember to donate $9.00 (or more) to Coffee Party USA. Coffee Party on! ETA: This entry has now been crossposted to the Coffee Party USA website.